WRENTHAM — Wrentham Town Administrator Kevin Sweet would like to provide the community with an update on some of the town’s ongoing planning projects. 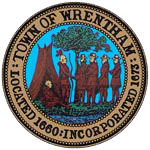 The Town of Wrentham is working on new zoning by-law regulations for the areas at the center of Wrentham that are currently zoned as Commercial-1 and Business-1 through local technical assistance grants from the Metropolitan Area Planning Council (MAPC). The goal of these new regulations is to encourage mixed-use development that is consistent with the character of Wrentham and that will attract development to the 50 acres of vacant land at the end of Kendrick Street and Depot Street. The town held a public forum last November to gauge support for the draft regulations, and feedback from residents was positive. There will be a second forum in August to present the final regulations before Town Meeting in November, when the new regulations will be presented for acceptance. Through a grant from the Massachusetts Gaming Commission, Wrentham recently completed a comprehensive study of the Route 1 Corridor that analyzed traffic circulation and safety, pedestrian and bicycle access, existing land use and zoning regulations, physical and environmental factors, and marketing for development and provided recommendations for each. The study was completed by Pare Corporation and McCabe Enterprises and the findings were presented at a public forum in February. One of the recommendations is to create new zoning regulations for the Route 1 Corridor that would provide consistent dimensional regulations and design standards. Wrentham will continue to work with McCabe Enterprises to create new zoning regulations through a second grant from the Massachusetts Gaming Commission. This project is expected to begin during the summer. “Thanks to the support of our residents we have made significant progress on the plans for these new regulations in town, which will have a tremendously positive impact on our community.” said Wrentham Director of Planning John Charbonneau. Anyone interested in additional information about these projects should contact John Charbonneau, Director of Planning and Community Development at 508-384-5441.